Tupac Amaru Shakur (June 16, 1971 – September 13, 1996), known by his stage names 2Pac (or simply Pac) and Makaveli, was an American rapper. 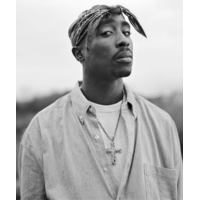 Shakur has sold over 75 million albums worldwide, making him one of the best-selling music artists in the world. In the United States alone he has sold 37.5 million records.Rolling Stone Magazine named him the 86th Greatest Artist of All Time. In addition to his career as a top-selling rap artist, he was a promising actor, and a social activist. Most of Tupac's songs are about growing up amid violence and hardship in ghettos, racism, other social problems, and conflicts with other rappers during the East Coast – West Coast hip hop rivalry. Shakur began his career as a roadie and backup dancer for the alternative hip hop group Digital Underground.